Burt's Bees signature Lip Balm formulated with Beeswax to naturally help protect lips, antioxidant Vitamin E to moisturize, and Peppermint Oil to soothe your lips. A replenishing and hydrating lip balm infused with the antioxidant goodness of Pomegranate Oil that restores moisture and texture to reveal smooth, supple, healthy-looking lips. A rejuvinating experience, this hydrating lip balm contains the powerful superfruit Açaí Berry. This deep purple berry grows in the Brazilian Rainforests and contains free radical fighting antioxidants, Vitamins A, C, D and E as well as healthy Omegas. Reduces lip inflammation due to weather, cosmetics, sunburn, or medications. SmartMouth's two solutions activates the Smart-Zinc™ technology, which eliminates and prevents bad breath for at least 12 hours. 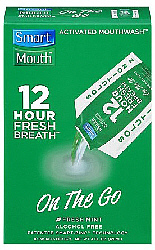 Rinse in the morning for fresh breath all day; rinse at night and wake up without bad breath...NO MORNING BREATH! No other moutwash can do this! Flossing cleans between your teeth where your toothbrush can't reach. It's key in helping prevent periodontal (gum) disease. Take care of your teeth and gums with REACH® Mint Waxed floss! REACH® Mint Waxed floss removes up to 52% more plaque than competitor brands.